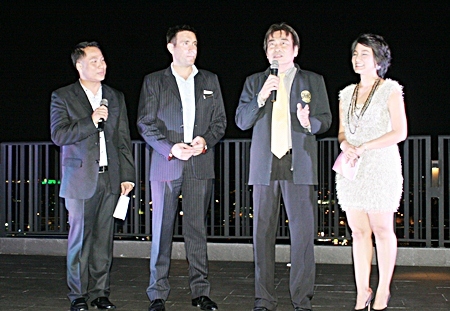 The Hilton Pattaya Hotel continued celebrating its second anniversary with a VIP party at its Horizon rooftop restaurant. Deputy Mayor Ronakit Ekasingh joined the list of invited guests Dec. 7 to welcome newly appointed General Manager Philippe Kronberg. Kronberg delivered a short, energetic speech in which he thanked everyone for the greeting and promised he would do his best to maintain the hotel’s reputation. Ronakit, in his speech, said hotels like the Hilton enhance Pattaya’s reputation and said he’s looking forward to working with the new GM. A drum and dance show followed and guests enjoyed wine, champagne and snacks. 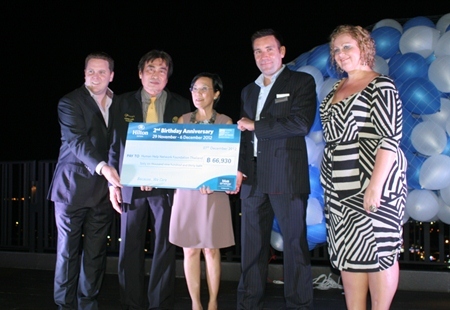 (L to R) Gerard Walker, Ronakit Ekasingh, Philippe Kronberg and Peta Ruiter present a cheque of 66,930 baht to Radchada Chomjinda (center). (L to R) Dhaninrat Klinhom, Philippe Kronberg and Umaporn “Poo” Rachatawattanagul listen to Deputy Mayor Ronakit Ekasingh’s (2nd right) welcome speech.